For the first weekend of the new year, when resolutions are starting to kick in and you have had a few healthy days after the festive period there is nothing better than a spot of baking as a treat for the weekend. 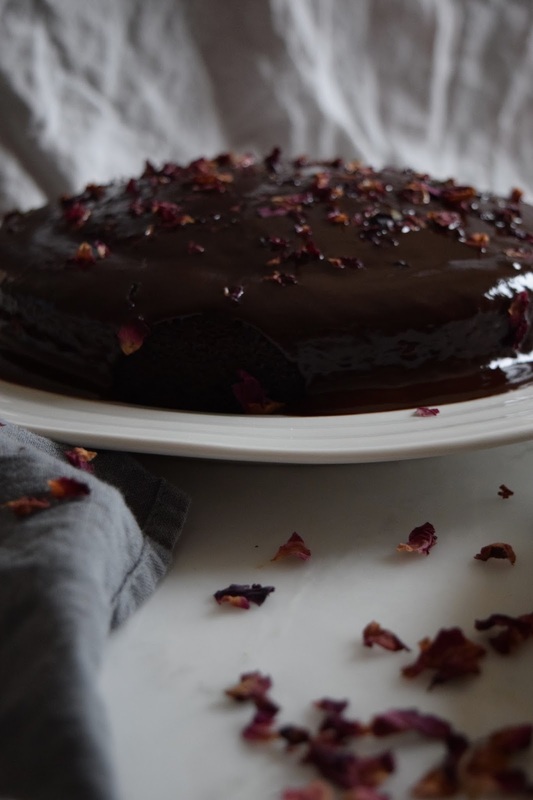 This cake is also different from other bakes as it substitutes butter with coconut oil and coconut butter therefore making it a great vegan option, the coconut oil also makes it deliciously gooey and fudgy and in fact I would make this cake even for non-vegans out there as I have never been able to achieve such a gorgeous, moreish texture! This cake is super easy, no need for a mixer or blender and nothing needs to be delicately folded. Its more of a throw together method. 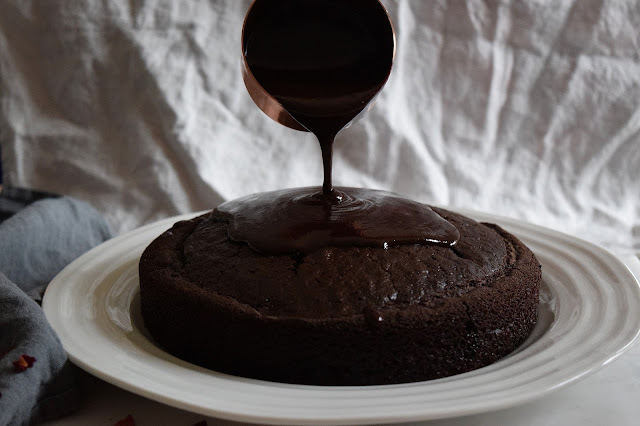 Start by preheating your oven to 180C and first start making the icing, mix together all the ingredients apart from the chopped chocolate, bring to the boil and then add the chocolate, turn off the heat and allow the chocolate to melt into the hot mixture, leave to cool while you get on with the cake. Line an 8in cake tin with baking parchment on the bottom and coconut butter around the edges. Next mix all the dry cake ingredients in a bowl and the sugar, water and coconut oil in another. Add the wet mix into the dry and mix until both are combined well into a glossy batter. Now pour into your greased tin and bake for 30 - 35 minutes depending on how hot your oven gets, check at 30 minutes with a knife or cake tester if you have one to see if the batter is cooked through (the tester should come out completely clean). At this stage the edges of the cake should also be coming away from the tin - another easy, visual sign your cake is done. 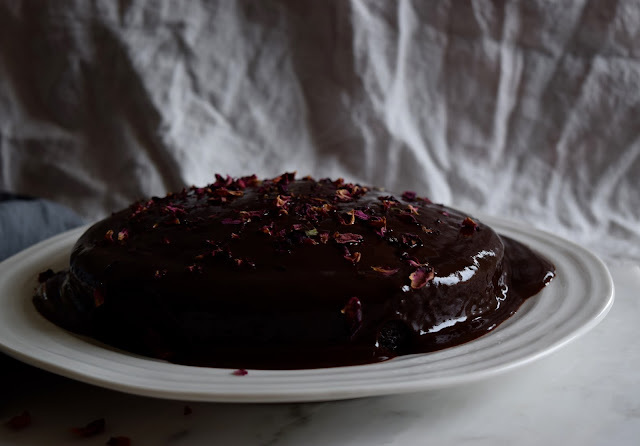 Let your cake cool in its tin and then transfer to a plate or cake stand and now get ready to smother your cake in the deliciously glossy icing you made earlier. 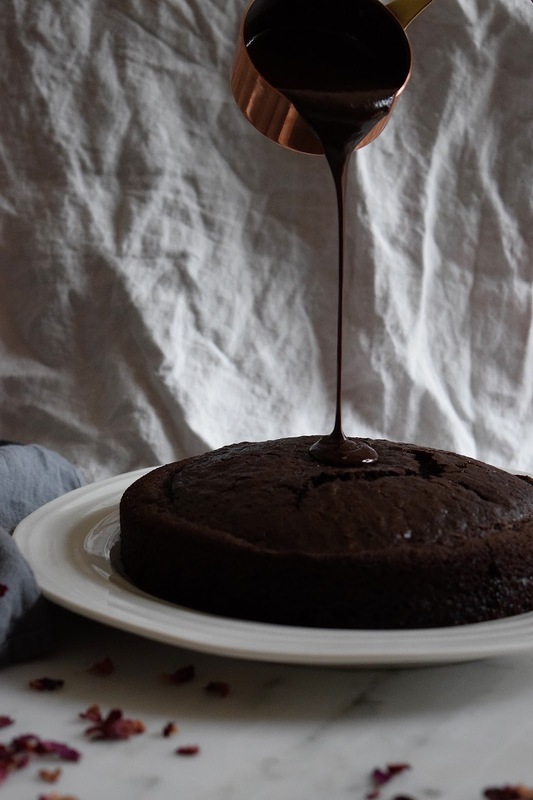 This is a delicious and decadent dessert to enjoy with friends on the weekend (as a nice end of week treat after a week of New Year dieting - as long as you go back to it come Monday!) This also makes a fantastic birthday cake for any chocoholics out there, just top with plenty of candles and enjoy with a glass of bubbly!